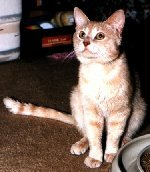 I began home blood glucose monitoring on Rusty (cat) in the summer of 1998. From the suggestions of others, I tried the ear sticks without success. My main problem with the ear method was that it seemed to irritate Rusty and on the occasions I had a successful *stick*, the drop of blood was lost to the walls after a shake of the head! Too nervous for leg vein draws, I decided to try the paws. In the beginning, I wrapped Rusty up in a beach towel, securely wrapping all paws but one. I do this in my recliner, with him between my leg and the arm of the chair on his back. After getting the meter and strips in place on my other leg, I then gently rub his paw and leg a few seconds as this seems to help stimulate blood flow. Once I see that I'm going to have enough blood, I push the strip in (I'm using the Glucometer Elite), hold the meter to his paw with one hand while securely holding his paw with the other hand. While waiting for the meter to countdown the 30 seconds, I securely hold a cloth over Rusty's paw to stop the bleeding. Once the second *beep* goes off, I let Rusty out of the towel and immediately give him a vitamin (which he thinks is a treat!) This is his reward for being so good! The first couple of weeks, my husband would distract Rusty by talking to him and petting him while I did the prick. But as time went on, I was able to do everything on my own. As more time went on, I was able to give up the towel. After a couple of months of BG testing, wrapping him in the towel seemed to upset him, but the BG tests didn't. One thing I found useful was using a lancet device shaped like a pen. The pen device allows you to aim at a small area such as a cat's paw pad with accuracy and seems to be less painful than a free-hand poke. Also, the cloth I use to wipe his paw I sometimes drape over his face for a second right before I lance. Rusty sometimes jumps a little when he sees the device and is anticipating the poke, but with the cloth on his face he has no objections. Rusty is a very young cat full of energy and my vet was quite surprised at how cooperative he is for me. However, cats can be conditioned to accept new situations and once they are in a routine (and see what's in it for them! ), they are usually pretty good. The only concern that I had about *paw poking* was the risk of infection from the litter box. I discussed with his vet and he felt like the risk is minimal as the lanced spots clot very quickly. Today, Rusty takes his *pokes* like a little man and is very conditioned to the routine. Although he doesn't jump in my lap as a volunteer at BG test time, he does cooperate and is very still, even after the first beep goes off and the blood is taken. However, the second beep goes off and my Rustbucket becomes a squirm! He wiggles and meows to get up and eagerly awaits his treatamin! For those of you thinking about testing, it is a wonderful diabetes management tool and your pet may be much more cooperative than you anticipate!